Throw on a pair of cargo shorts, jump in the jeep and don’t forget your camera, because we’re going on an animal safari! And it all begins in the palm of your hand. Or, more accurately, with the palm of your hand. Printing using hands and feet is brilliantly messy and incredibly fun, not to mention easy and already manageable (and highly enjoyable) by the youngest ones. 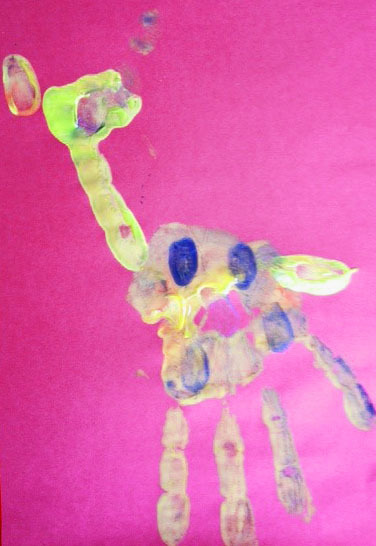 With just a little bit of imagination you can bring handprints to life, creating lots of different animals and shapes. This is a great activity to introduce a more concise method of painting with little ones, as they can think about what colours can go where on their hands and how to use fingerprints to add simple but effective details. 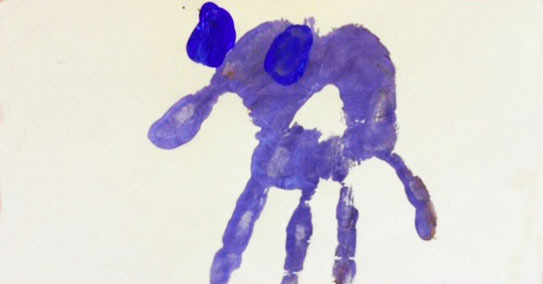 We’ve dreamed up a few ideas for animal handprint art, but we’re quite sure that the fun of creating more and more different animals will continue until you’re running out of paint! You might just end up with an entire safari across the kids’ bedroom walls! 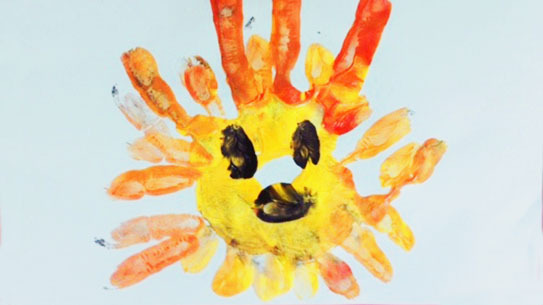 For the older children, let them look at some pictures of animals and see if they can recreate them with their hands, manipulating them into different shapes and working out what each finger, thumb and palm could represent. If you want to go a little bit further (and maybe the weather allows to get going outside to avoid the chaos painting can have on oh-so-innocent carpets and floors) you could also experiment with footprints. What animals pop into your kid’s heads when they look at their feet? Maybe a crocodile? A horse, with just the addition of some ears? The wings of a butterfly? Or something else entirely? 1 Have a look at some pictures of animals, the colours of paint you have and the shape of your hand or feet to see what animals you can try to recreate. 2 Dip the brush into your paint and paint your hand. Think about what parts of your hand you want to print and make sure there is lots of paint on it! 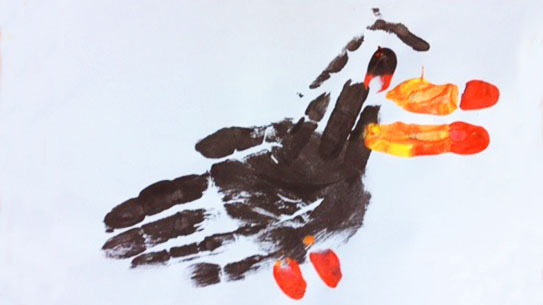 3 Press your painted hand on the paper. Push down quite firmly and then carefully remove your hand from the paper. Wipe your hand with a wet wipe. 4 Add extra detail by painting fingers, thumbs or fingertips, and press down over your painting. Think about how to add tails, eyes, noses/beaks and ears. Wash your hands and think of another animal to create! To get going, why not try to recreate some of our animal prints? Use your thumb for a trunk (stretch it out away from your fingers) and then add thumb prints for big, floppy ears. Lion: Paint your palm yellow and your fingers orange. Spread out your hand and print. Then add more orange paint to your fingers and print to make his mane thicker. Use your fingertips to give him eyes, and a sideways thumb for his nose. We had to! 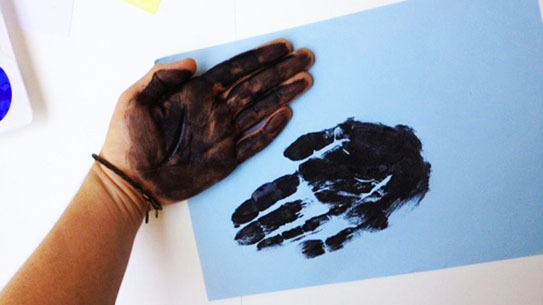 Paint your hand black and press your fingers together, then print. Paint your forefinger and middle finger red and yellow and print sideways for his beak. Add fingerprint feet and an eye. Paint your hand yellow and print. Use your forefinger to make a long neck, two fingers to make a head and then add brown fingerprints to decorate the fur. The fun doesn’t end with the creation of the handprint animals. After you’ve allowed the pictures to dry you can do loads of different things with them. Cut out the handprint animals and attach a lolly stick or piece of cardboard to the back. Grab a few blankets and create a puppet theatre stage. Decide with your kids who is the actor and who is the audience (spoilers: they might just want to be the actors). Now, they’ll need to rehearse the play. That gives you some time to have a cup of tea (or possibly more realistically, clean up all the painting mess from earlier. Sorry.). Create an entire safari park in the kid’s playroom using cardboard boxes, washed food containers or anything that could work to define the kids compound. You may need to cut out the handprints or may want to add some more background drawings on the pictures to match the story that your children come up with. Discuss the scene the kids are building and try to add in a few fun facts, like how lions are no danger for grown-up elephants, and how elephant babies gets protected from the whole elephant herd to avoid being harmed by lions. Yes, we like facts about lions and elephants. Pin up the handprint pictures on the wall, letting the kids decide where each one goes. Have a look at the sequence at the end. Can they tell a story that follows this sequence? Try mixing them up. Can they come up with a completely different story? We’d love to see your creations. Share them on our Facebook page or tweet us @toucanbox!